Estonian culture and national identity is largely founded on (base) texts. During difficult and revolutionary times a writers’ word has offered understanding of man and of the world, consolation, hope. 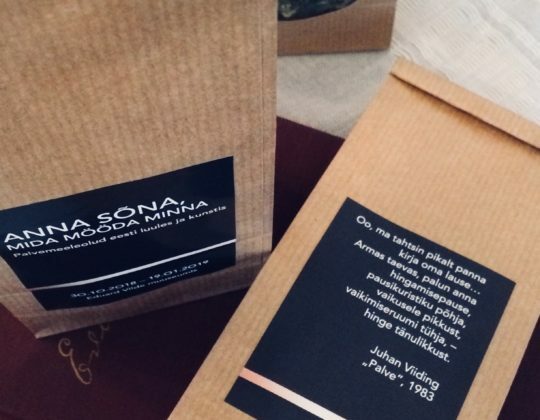 Since Christianity and the Church with the first translated prayer books constitute the backbone of the local intellectual culture, it is understandable that Estonian early literature (as well as music and art) is pervaded with a strong Christian dimension. We can see a Christian framework and a lot of biblical motives in the works of Lydia Koidula, Anna Haava, Aino Kallas, A.H.Tammsaare, Uku Masing, K.Ristikivi et al. The use of ecclesiastical word in Estonian literature has not been the focus of the study of literature, says professor Rein Veidemann (Regarding the meaningfulness of Bible in Estonian literature, 2013). This exhibition will give its contribution through the motive of prayer to raise the topic. 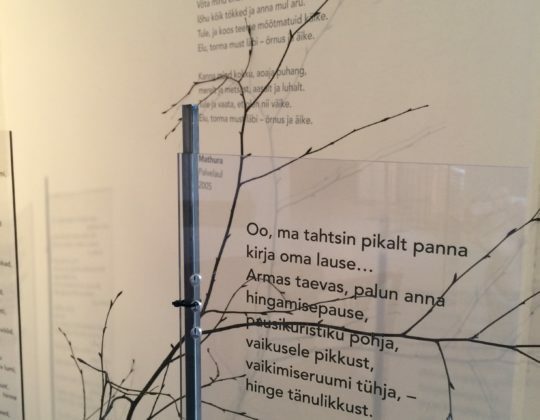 In the focus of the exhibition “Give a Word, to Follow” are the poetic prayers of Estonian poets from the years 1917-2014. The authors presented are the heavy artillery of Estonian poets: Anna Haava, Juhan Liiv, Uku Masing, Jaan Kaplinski, Jaak Jõerüüt, Viivi Luik, Doris Kareva, Jürgen Rooste, Leelo Tungal, Kätlin Kaldmaa, etc. In the texts written throughout the century the prayer manifests as a state (of perception), as a dialogue (with the source, nature, God) or as a journey (to one’s soul’s essence). There is spiritual poetry, passionate enchantment, thoughtful reflection. There are prayers for Estonia and its’ liberty at the time, but also today’s urbanistic man’s existential prayers for a meaning of life, for clean air, for love. The poetry pilgrimage that unravels in this exhibition intertwines solemn and mundane, timely and timeless, earthly and divine, a personal and a collective voice. 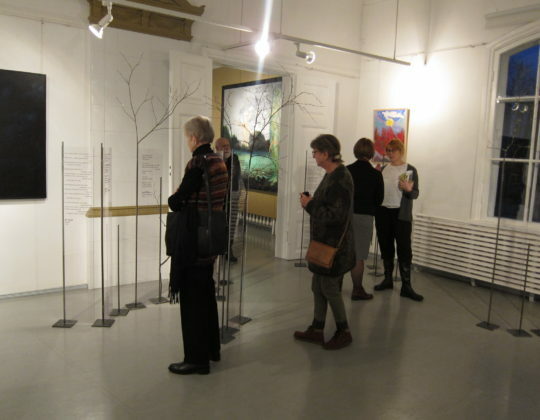 This exhibition is a unique poetry pilgrimage that tells the tale of a 100 years old Estonia. 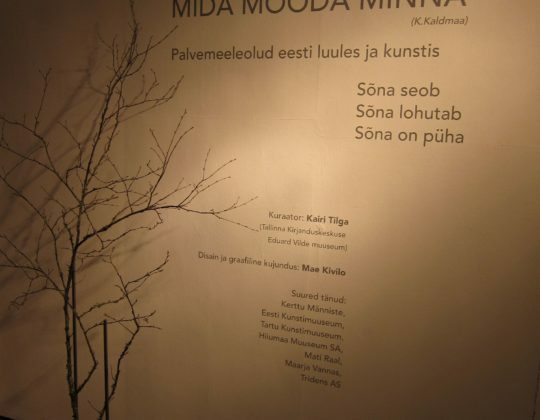 The textual side of the exhibition is complemented with numerous artworks that have been selected from the collections of The Art Museum of Estonia, Tartu Art Museum, Museum of Hiiumaa and private collections according to the messages and characters of the poems. In making the selection we didn’t follow the title “The Prayer” or the motive of a prayer, but sentiments of nature meditation, self-searches and humanity that would form a mental unity of visual art and poetry. 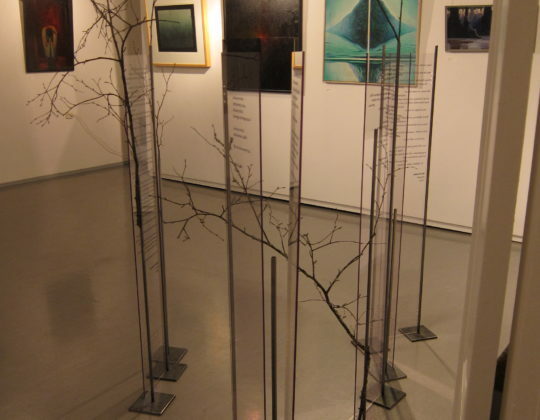 The following esteemed Estonian artists work is present: Epp Maria Kokamägi, Jüri Arrak, Sirje Runge, Toomas Vint, Kristjan Raud, Viive Tolli, Kaljo Põllu et al. 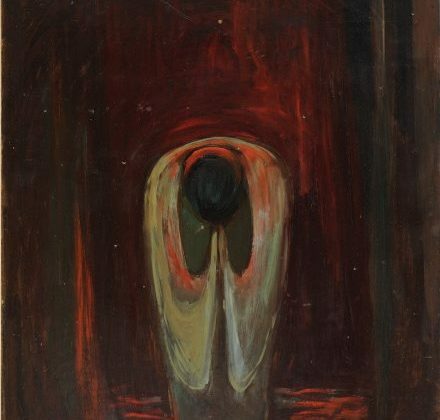 You can also see the rare painting “Silence” by the theologian, thinker, poet Uku Masing (1909-1985).